History of Muay Thai & Muay Thai training. What is Muay Thai? What is Muay Thai or Thai Boxing? Muay Thai or Thai Boxing is the national sport and cultural martial art of Thailand. It was developed several hundreds of years ago as a form of close-combat that utilizes the entire body as a weapon. Today its definitive origins are debated by modern scholars, as much of the muay thai history was lost when the Burmese ransacked Ayudhaya, Siam’s capital city in Thailand, during the 14th century. Most written muya thai history was lost when the Burmese looted the temples and depositories of knowledge held in Ayudhaya, and what volumes were saved are now national treasures that are preserved and protected as documentation for Thai culture and heritage. Muay Thai is referred to as “The Art of Eight Limbs”; and using eight points of contact the body mimics weapons of war. The hands become the sword and dagger; the shins and forearms were hardened in training to act as armor against blows, and the elbow to fell opponents like a heavy mace or hammer; the legs and knees became the axe and staff. The body operated as one unit. The knees and elbows constantly searching and testing for an opening while grappling and trying to spin an enemy to the ground for the kill. The King of Thailand is an avid fan of Muay Thai. Since being crowned its popularity has grown more than in any other era in history. 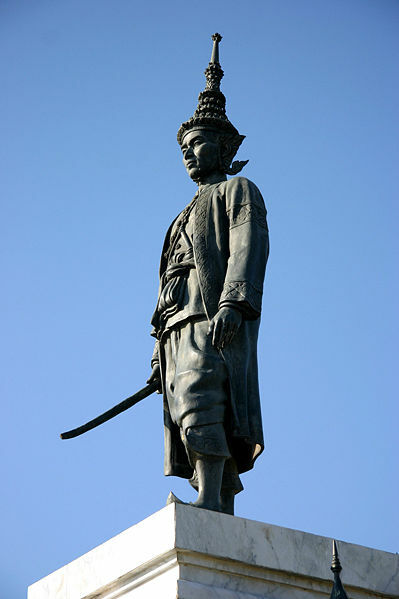 In 1238 (Buddhist years), the first Thai army was created in the northern city of Sukhothai, Siam being its capital. The recorded history shows that a need to defend the capital city was spawned by many wars being fought between neighbouring tribes and kingdoms. The Siamese army was created to protect the government and its inhabitants within the city and surrounding villages. Soldiers were taught hand-to-hand combat and how to use weapons, as well as how to use the entire body as a weapon. Their training is what eventually evolved into Muay Thai and Krabi Krabong. Learning the military arts or “Muay Thai” became engrained in the culture of the early Siamese people. With the constant threat of war, training centers slowly began to appear throughout the kingdom. These were the first Muay Thai camps. Young men practiced the art form for various reasons: self-defense, exercise, discipline; monks even instructed at many Buddhist temples, passing down knowledge and history from one generation to the next. As Muay Thai became popular with the poor and common people, it also became a required staple for the high-class and royalty. The two sons of King Phokhun Sri In Tharatit, the first King of Sukhothai, were sent to learn at the Samakorn training center. The common idea was that good warriors made brave leaders and this would prepare them as future rulers of the kingdom. Phokhun Ram Khamhaeng university is named after the writer of the first ancient text of Muay Thai. It is located in Bangkok along with the Sport Authority of Thailand. With many wars being fought between the developing countries of Thailand, Burma (Myanmar) and Cambodia, the development of large armies became necessary to protect and ensure the survival of the Thai kingdom. Young men were trained in warfare at training centers throughout the country, devoting themselves to learning hand-to-hand combat, the sword, staff and stick (“Krabi Krabong”). Phudaisawan Center for swords and pole arms became the most famous of the these training centers and was considered to be the eras equivalent of a college or university education. 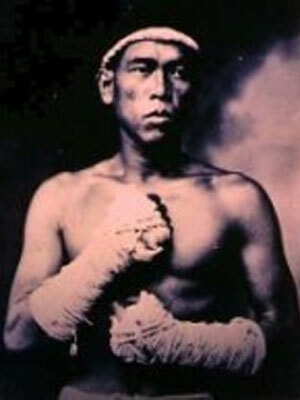 King Naresuan loved Muay Thai and fighting competitions. He would eventually become a Muay Thai legend, calling upon the men who had been beaten and displaced by the Burmese warriors to become scouts and jungle warfare soldiers that would eventually liberate Thailand from it’s Burmese occupants around 1600. During this era Muay Thai became a national sport, developing the fundamental traditions that would remain the same for the next 400 years. The Mongkong (headband) and pa-pra-jiat (armband) were both introduced and the first “ring” was made by laying a rope on the ground in a square or circle as a designated fighting area. The fighters used hemp ropes and threads as hand coverings which wrapped around the hands and forearms. A thick, starchy liquid would sometimes be used to bind the threads and make the striking surface harder. Now, 400 years later, TWINS is Thailand’s #1 Muay Thai equipment manufacturer. In the first professional fights, fighters were not matched up by weight, height, experience or age. There were no time limits on fights; they continued until there was a definite winner. Local champions would represent their city or village, and often times fought on behalf of wealthy businessmen or royalty as a way for them to settle disputes. Losing a fight often resulted in the fighter and/or businessman losing face. Gambling on Muay Thai matches was as popular then as it is now in stadiums across the country. King Prachao Sua loved competing in Muay Thai. He was known for entering tournaments in small cities and villages disguised as a commoner. Because no one recognized him as the King, he was allowed to participate in a tournament against several notable fighters. According to the legend, he defeated three fighters named Nai Klan Madthai (Killing Fists), Nai Yai Madklek (Fists of Iron), and Nai Lek Madnok (Strong Fists). The “Tiger King” was forced to disguise himself because Thai people hold their King in such high regard that out of respect, no one would have fought him. Prachao Sua loved the sport so much that he made his two sons, the princes of Thailand, study Muay Thai, sword fighting and wrestling. During this time the Department of Royal Boxing was founded with the responsibility of finding and recruiting worthy men to fight as entertainment for royalty and to become guards in Thani Lir, the royal court. As royal guards, they were also given the task of training the members of royalty in combat and Muay Thai, as they were still at war with Cambodia and Burma. During this period known as the Thonburi Era, Thailand began to see peace and the kingdom was slowly being reconstructed. Training in Muay Thai was generally for Soldiers in the military and a favored past-time for those who were not. With the country’s new found peace, the sport began to turn more competitive. Camps would match their best fighters agasint each other for entertainment. As there were still no formal rules, they lasted until a clear winner was left standing. By the time of the reign of Rama I, Muay Thai had become a national fighting art and rules and regulations were introduced. The sport had become an integral part of celebrations and festivities across the country. The length of each round was measured by a coconut with a small hole that would float in water. The coconut filling with water and sinking to the bottom of the barrel signified its end, though there was still no limit to the number of rounds per fight. Combatants continued to fight until a clear winner was chosen, or one person was left standing. King Rama I was a Muay Thai enthusiast from an early age, training and traveling to watch matches throughout the kingdom. As the legend goes, in 1788, two brothers from France came to Thailand in search of boxing or fighting competition. One of them was a fighter of some renown and had fought throughout other countries during their travels. He wanted to fight for prizes against a Thai boxer. The King consulted with Pra Raja Wangbowon, the head of the royal boxing ministry, where they agreed upon a bet of 4000 Baht (50 Changs) and to hold the fight at the Grand Palace at the temple of the emerald Buddha. A ring of 20 X 20 meters was constructed specifically for the fight. Early in the match it seemed the fighter from France was too strong for the smaller but faster Thai. Eventually he began to tire, and seeing that he was on the verge of losing, his brother broke the rules by hastily jumping into the ring to help. This caused a riot and fighting ensued between the foreigners and Thai guards and spectators. Disgraced by their actions, the brothers left soon after. King Rama V realized the value of Muay Thai and did much to promote the sport from the late 1880’s to the turn of the century. 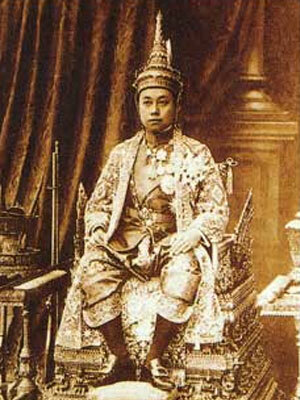 He promoted tournaments and “Muay Luang”, also called Royally appointed Boxing Centers throughout the kingdom, which often served as a way for him to find personal guards or Royal officers when a fighter was victorious. Often times the top fighters at the Royal Muay Thai Centers would be given personal invitations by the King to fight at tournaments, festivals and important international events. The Department of Education was created in 1887, with Muay Thai as part of the Military Cadet teachers school curriculum. Muay Thai was introduced to Europe and the rest of the world during the first great war. Thai soldiers were stationed in France, and the commander would organize Muay Thai bouts for to boost the morale of the servicemen. French boxers would often participate and compete against the Thai fighters. The first permanent boxing stadium was built at the Suan Khoolab School after the war. They still did not have the modern gloves used today, so fighters’ hands were wrapped in cotton and hemp. Mongkongs were worn on their heads and pra-jiats around their biceps. The distinctive style that is Muay Thai is thought to have developed over centuries as the major tribes of that era (one of which was the Siamese) migrated through China, Vietnam, Laos, Burma and Cambodia. The Thai tribes moved south, fighting fiercely to survive as they encountered other tribes in what is now northern and central Thailand, and as far south as Malaysia. The rudimentary elements that defined Thai Boxing as a fighting style began to take root. Through training, military exercises, combat and loss of life, techniques became precise and specific. The goal of each strike and movement is to deliver an excruciating, debilitating blow which would enable the fighter to quickly overcome his rivals without leaving himself exposed to an attack. Thus, proper technique and power strikes were a vital element in their training. Veteran soldiers and fathers taught their students and sons the offensive and defensive tactics and techniques, proper posture and positioning and skills to enhance awareness. Those students and sons went on to teach their children, and from there the core elements that make up Muay Thai today had become a permanant foundation. It would seem that the most effective hand-to-hand form of combat evolved in a rather Darwin-like manner. It demanded the survival of the fittest: those who fought and prevailed lived and taught others before eventually falling themselves. The Thai were constantly on guard anticipating attacks from neighboring countries like Burma and Cambodia. The Burmese and Thai had fought each other in many wars over the centuries, causing much destruction in both countries. 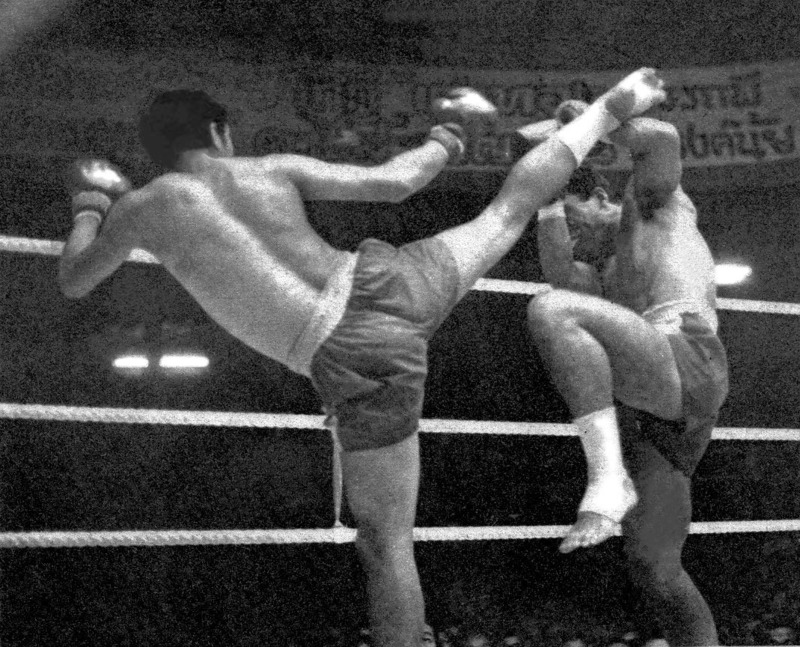 The wars against the Burmese, Cambodians and other invaders helped refine the art of Muay Thai, teaching the Thai combatants much about engaging in combat. When the young men returned from tours of duty with the Thai military, they often engaged in matches for sport and fun. Older soldiers, being survivors of many battles and hand-to-hand confrontations, became “Kroo Muay” – instructors and teachers. A local fighter from each province, town and village who showed promise in the sport would garner the respect and support of the local inhabitants. The love of the sport and importance of an effective defense system for the kingdom made Muay Thai a vital part of the Thai culture for the next 500 years as the skills were passed through the generations. The Wai Kroo is a ritualistic dance carried out before fighters engage in the ring. The tradition dates back several centuries and is meant to show honor to the fighter’s teacher, the sport of Muay Thai and his country. The Ram Muay is a dance unique to each master instructor and taught to his students. The student will dance in each direction of the ring, touching each corner post with a prayer, showing his respect to his opponent and the spirits. Muay Thai has progressed significantly over the past 100 years. Due to the noticable national popularity, it began to garner international recognition and exposure. In World War II, after formally being introduced to Muay Thai, foreigners named it “Siam Boxing”, as Thailand was formerly Siam. The French labeled it as “Le Sport Orient” or the fighting style of the orient. Soldiers from Europe and America would watch attentively as the Thai soldiers practiced Muay Thai amongst themselves. They were so impressed with the style of fighting that they asked the Thai soldiers to teach them the fundamentals and traditions of Muay Thai. As it became more popular internationally, the rules began to change so it could be better organized and governed like established sports such as boxing. In the 1920’s, rings were introduced to replace open courtyards, which ultimately planted the roots of modern Muay Thai. Gloves similar to those used in boxing matches replaced the old horsehide, hemp rope or leather bindings and a hard-cover groin protector was added as extra protection from brutal kicks and knees. The first formal rules were introduced to the sport of Muay Thai after WW II ended. Fights were divided into 5 rounds with a time limit on each; a clock was used to determine the length of each round instead of a coconut shell with holes sinking in a barrel of water, and major Muay Thai stadiums were erected in large cities thoughout the country (namely Bangkok, Sukothai and Chiang Mai). Bangkok’s Lumpini Stadium is now almost considered the “holy ground” to the masses of Muay Thai fighters, local and foreign. An integrated system of weight-classes, absolute rules and championships was brought to life in the years ahead as the organization of the sport began to resemble boxing. Unlike boxing in Europe and America, Muay Thai fighters make very little money fighting. Many will take fights every 3-4 weeks, earning 4000-6000 baht ($100), which is barely enough to support themselves, let alone a family if they have one. Muay Thai fighters train many hours a day and often begin when they are 6-8 years of age. They typically take their first fight when they are 8-10 years old and may accumulate as many as 120-150 (3 times as many as an active boxer) before they reach their mid-twenties. 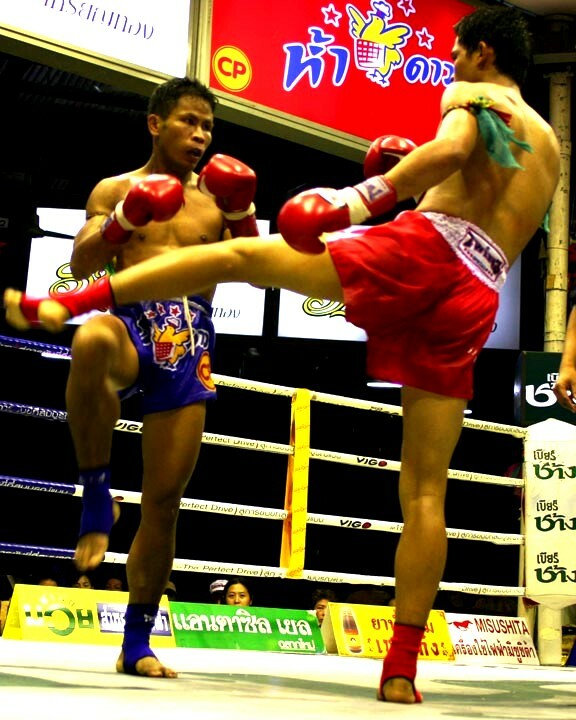 Due to how physically demanding the sport is, and how early the average Thai begins fighting, Muay Thai fighters generally do not have long careers. Muay Thai fighters are known for their tough skin and ability to ignore pain and injuries, which are quite common. The fighters deal with everything from cuts and lacerations to the face and head to broken bones and severe sprains throughout their careers. Today Muay Thai is becoming very popular on a global scale. It was recently accepted as an Olympic sport, finally gaining it’s deserved recognition. Professional martial artists from all sides of the fighting spectrum agree, Muay Thai is essential to becoming an all-around multifaceted fighter. 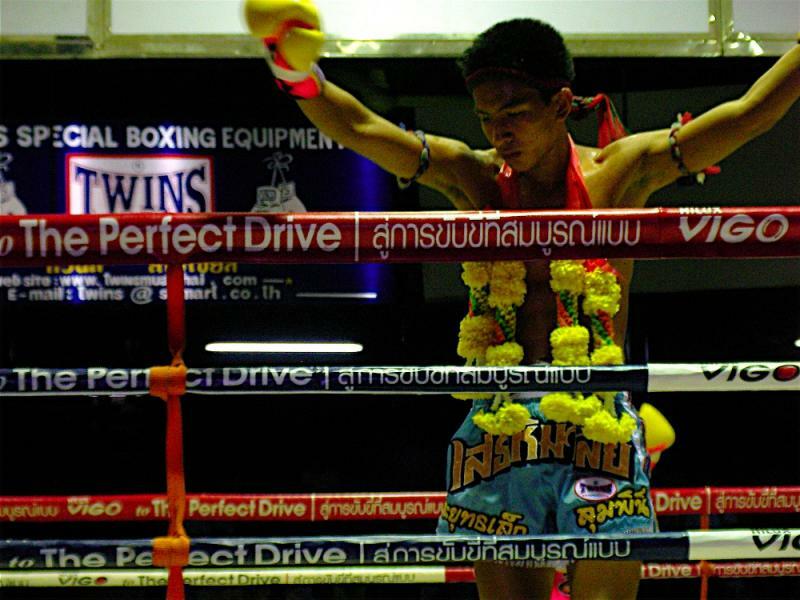 As new training camps and gyms open around the world, Muay Thai will continue to grow in popularity. Before there were TWINS Muay Thai heavy bags, agility balls, long banana bags and other equipment we use to today, Muay Thai fighters had to be resourceful and rely on readily available tools to help them train and condition. Thailand’s tropical environment garners an abundance of banana and coconut trees, rivers and streams and manual labor; all of which fighters relied on to become better and more skilled in the sport. One of the most popular and well known training techniques of “old-style” Muay Thai fighters was kicking banana trees. The soft and porous nature of the banana tree was ideal for practicing leg kicks and knee strikes. Fighters would practicing striking using a tree around 18-24 inches in diameter, and slowly wore it down using a variety of techniques until it fell over. The banana tree was preferred because it was soft enough to not damage the fighters leg, but hard enough to powerfully strike with kicks or knees many times before it would fall over. Often times fighters would roll small logs along their shins or strike them with bags of sand, the intention being to toughen the skin and build calluses which would provide extra protection during a fight. Hard shins and tough skin were an important part of being a good Muay Thai fighter. The coconut tree was also utilized in many creative ways when it came to training. The Thai fighters would often climb them to strengthen their legs, slowly pushing with their feet and contracting their thigh muscles. The rough bark helped harden their feet, and even the coconuts themselves were used to aid in training. The fighters would place half of a broken coconut shell on the ground, partially fill it with sand, and then repeatedly strike their elbows into the shell and sand. This helped them practice their aim while similtaneously toughening their elbows, making them hard and coarse for fighting. To practice striking accuracy on a moving target, the Thai warriors would often hang a coconut or lime from a string or vine and punch, kick, elbow and knee the moving target which mimiced their opponent in the ring. It is also believed that the fighters would slowly and methodically strike the hard husk of a coconut with their fists until it split, exposing the fruit inside. This can still be seen at Muay Thai shows for tourists throughout the Kingdom of Thailand. Another popular and effective method for strength training was digging a small pit from knee to waist deep to jump in an out of. The fighter would only use the strength and explosive power of his legs to propel him upwards and land on his feet. This is very similar to the modern practice of plyometric training popular among Muay Thai and MMA fighters today. Thai fighters would also practice walking against the current of a strong stream and through thick, muddy rice fields to help build strong calf and thigh muscles. In order to practice not blinking their eyes when getting struck in the face, the Muay Thai fighters would stand in rivers and slap the water into their faces while attempting to keep their eyes open. rivers to force themselves to keep their eyes open and not cover them as water splashes into their faces. Another favored and very popular Muay Thai training technique is called the Muay Thai circle. A group of fighters would form a circle with one person in the middle. The fighter in the middle would then train with each person in the circle for a designated amount of time, switching at even intervals. They would often go through 5-6 opponents in a row, for approximately 10 minutes, to improve their clinching skills while building endurance and stamina. 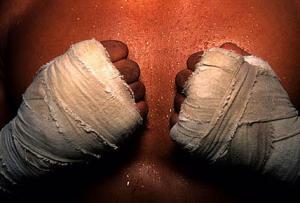 If a fighter can train for 10 minutes without a break, then a 3 minute round in the ring will be much easier to endure. The Muay Thai circle of training is still practiced today, and is a training technique commonly used at Tiger Muay Thai and MMA training camp, Phuket, Thailand.